Access, Access, Access!! You only need to drive 2 minutes off of the freshly paved coastal highway to get to this 2 storey, 4 bedroom home with sweeping ocean views that extend from Cano Island in the south to Manuel Antonio in the north! The property is part of a development called VISTAZUL and is very secure with a private, gated road that only accesses these 9 lots. The 1.25 acres also comes with a second building site that isvery large and has the same amazing views as the house. 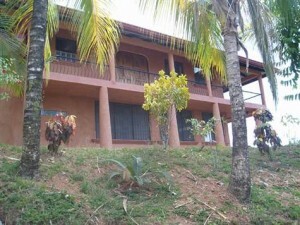 It is a short drive to the beach in Hatillo, Guapil, and Dominical. Now that the road is paved this is a very desirable area.